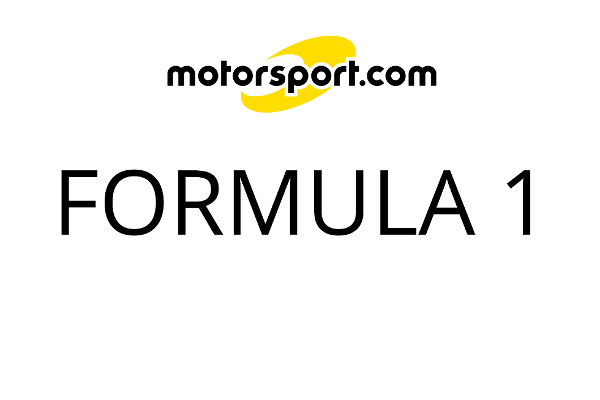 Believe it or not, it was initially a Minardi one-two after the first qualifying session for the French Grand Prix, Jos Verstappen claiming provisional pole with a 1:20.817. The Dutchman was just one and a half tenths ahead of Justin Wilson, it was a fantastic result for Minardi. Unfortuantely, Wilson's time was disqualified after scrutineering found his car was 2kg overweight. However, it was an unusual session as the track was initially wet from earlier but dried as it went along, which means, obviously, that Minardi's result is not a real indicator of the state of play. Initially drivers were on wet or intermediate tyres and by the end conditions had improved enough for dry tyres. The later runners had an advantage that produced a very interesting line up indeed; most of the ususal back-of-the grid at the front. The track was still damp from earlier rain, but drying as Michael Schumacher opened the proceedings. 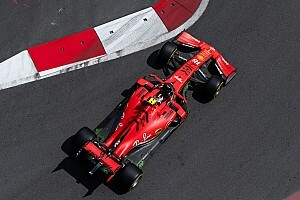 The Ferrari clocked 1:27.929, about a second off Mark Webber's best in morning practice. 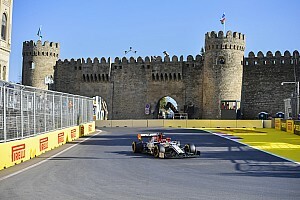 Kimi Raikkonen followed and was slower by over a second from Michael after poor first and second sectors. Ralf Schumacher was slower again to slot into third, the early part of the lap seeming to be the problem area. Williams teammate Juan Pablo Montoya was fractionally up on Michael first off but lost out in the middle sector, taking second. Renault's Fernando Alonso rounded off the first group and was 1.5 seconds down on Michael for fifth, after having a bad final sector. Rubens Barrichello started the second group and had a slight mistake at Estoril but the Brazilian went on to beat teammate Schumacher with a 1:27.095, eight tenths up. David Coulthard went best of all in sector one but lost out later to slot into third. Jarno Trulli was also up in one but a poor middle sector put him fifth, ahead of Raikkonen. The drying track saw the Michelin runners start to pick up but the Bridgestone shod Ferraris had the advantage initially. Jordan's Giancarlo Fisichella was the third Bridgestone runner to go out and shot up third behind the Ferraris, although over a second off provisional pole. Jenson Button, no doubt relieved to be on track after the problems BAR had, was last of the group and had the disadvantage of missing practice this morning due to the cars still being impounded. Driving the Magny-Cours circuit for the first time this weekend, Button was 3.5seconds off pole to go tenth. Fastest man in practice, Mark Webber had a very fast first sector, over a second up and carried through to take provisional pole by almost two seconds, 1:25.178. Revenge, perhaps, for Michael bumping into him in the pit lane earlier and knocking off the Jaguar's front wing. A drier line on the track was definitely warming the Michelins up. However, Bridgestone runner Heinz-Harald Frentzen was the first Sauber and whapped it into second, nine tenths adrift of the Jaguar but nearly a second faster than the Ferraris. Toyota's Cristiano da Matta also put in a flyer, taking third, in what was starting to look like a rather unusual provisional grid. Olivier Panis kicked off the final group of five, setting the fastest first sector but dropping marginally in the latter half to go second, just over a tenth down on Heidfeld. Ralph Firman had such a fast middle sector he was next to take pole for Jordan, 1:23.496, half a second up. Antonio Pizzonia couldn't quite carry the pace through and went fourth quickest. As usual, that left the Minardis to run -- but what on earth could happen next? Jos Verstappen was fastest of all in sector one, then two…then three! Provisional pole, 1:20.817, over 2.5 seconds up. Justin Wilson must have made Paul Stoddart the happiest man on the planet, slotting in behind Verstappen for a Minardi one-two. 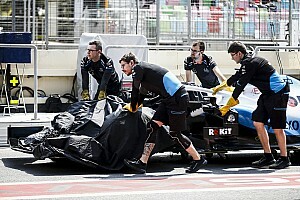 Minardi was still delighted, despite Wilson's time being disallowed: "We fully respect the FIA’s decision on this matter," said team boss Paul Stoddart. "And the fact is, Justin will always know he crossed the line in P2 at the end of this memorable qualifying session." Obviously the conditions were the deciding factor and, of course, tomorrow is when it counts. However, more unusual results could be in store as the top runners today should have better track conditions by the end of the session tomorrow: as long as it doesn't rain. For today at least, Minardi can revel in its moment of glory and no matter they whys and wherefores, Verstappen and Wilson made it a memorable day for the team. Final top eight classification: Verstappen, Wilson, Firman, Heidfeld, Panis. Pizzonia, Villeneuve, Webber.